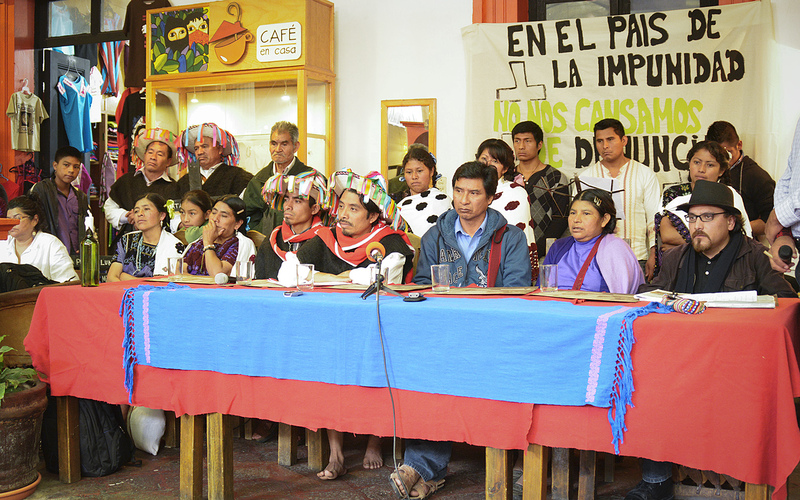 On 12 August in a press-conference, the Las Abejas Civil Society of Acteal denounced the construction of impunity through fear, on the sixth anniversary of the beginning of the Supreme Court for Justice in the Nation’s (SCJN) release of the paramilitaries who killed 45 people and four unborn children in 1997 in the Acteal community, Chiapas. They denounced that, for them, “since this day the justice system in Mexico is rotten garbage. For 6 years it has been clear in our memory the ignominy toward the blood of our brothers and sisters massacred in Acteal.” They declare that they have decided to “construct another justice that is sane and human,” and they manifest that they are here “because the Other Justice is built with memory. We are here to denounce impunity.” They also denounce that the Special Prosecutorial office for Indigenous justice has not investigated those responsible for the murder of Manuel López Pérez, who was killed on 23 July with the complicity of local authorities from the municipality of Pantelhó, Chiapas. Beyond this, they distance themselves from the “Pacifist Council of Sowers of Peace” and clarify that this group does not belong to Las Abejas. This entry was posted on Thursday, September 10th, 2015 at 11:10 am and is filed under Acteal, Centro de Derechos Humanos Fray Bartolomé de las Casas, Chiapas, EZLN, Human Rights, Human Rights Defenders, Indigenous people, Justice system, Militarization, Paramilitary. You can follow any responses to this entry through the RSS 2.0 feed. You can leave a response, or trackback from your own site.